A male northern white-cheeked gibbon (left) and a mother carrying her baby hang out in a treetop in Vietnam's Pu Mat National Park in a recent picture. The animals are part of a newfound population of more than 400 of the gibbons, which are deemed critically endangered in Vietnam and Laos by the International Union for Conservation of Nature. 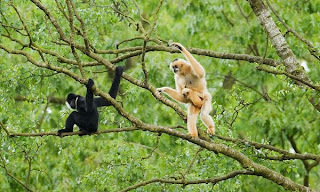 The gibbons, which have declined due to widespread hunting and logging of their habitat, are likely extinct in China. Conservation International had been searching for the rare primates since 2008, finding only a few scattered groups—until now. New auditory sampling surveys—during which researchers record the calls of gibbon "families"—have revealed that Pu Mat is home to 130 gibbon groups, for an overall population of roughly 455 individuals. The discovery of such a large gibbon population may mean the species has a better chance of long-term survival, the scientists say. On the Prowl - Snow Leopard Population Thriving!